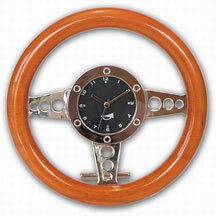 This large size racing steering wheel clock is a stylish timepiece that appeals to anyone who enjoys motoring. Here shown in the light wood color, also available in dark wood. Each piece is gift boxed.